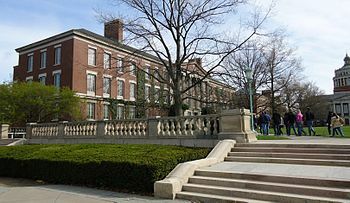 The University of Rochester (commonly referred to as U of R or UR) is a private, nonsectarian, research university in Rochester, New York. The university grants undergraduate and graduate degrees, including doctoral and professional degrees. 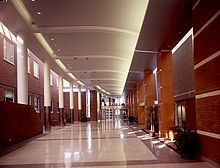 The university has six schools and various interdisciplinary programs. The University of Rochester is particularly noted for its Eastman School of Music. 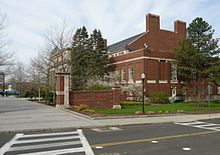 The university is also home to the Institute of Optics, founded in 1929, the first educational program in the US devoted exclusively to optics. Rochester's Laboratory for Laser Energetics is home to the second most energetic fusion laser in the world. In its history, five university alumni, two faculty, and one senior research associate at Strong Memorial Hospital have been awarded a Nobel Prize; eight alumni and four faculty members have won a Pulitzer Prize, and 19 faculty members have been awarded a Guggenheim Fellowship. 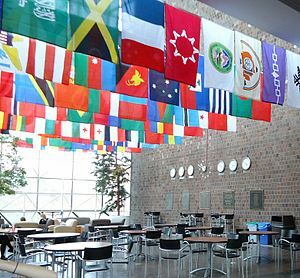 The departments of political science and economics have made a significant and consistent impact on positivist social science since the 1960s; the distinctive, mathematical approach pioneered at Rochester and closely affiliated departments is known as the Rochester school, and Rochester graduates and former affiliates are highly represented at faculties across top economics and political science departments. The University of Rochester, across all of its schools and campuses, enrolls approximately 5,600 undergraduates and 4,600 graduate students. Its 158 buildings house over 200 academic majors. Additionally, Rochester (along with its affiliated Strong Health System) is the largest employer in the Greater Rochester area and the sixth largest employer in New York. 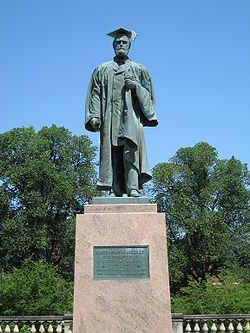 The University of Rochester was founded in 1850 as a Baptist-sponsored institution. The impetus to form the university came primarily from the town of Hamilton, New York, which has been home to Colgate University since 1819. In 1848, the Baptist Education Society planned to move Colgate University (then known as Madison University) to the city of Rochester, but was halted by legal action in Hamilton. Dissenting Colgate trustees, faculty, and students founded the University of Rochester with a charter granted from the Regents of the University of the State of New York on January 31, 1850. Classes began that November, with approximately 60 students enrolling, including 28 transfers from Madison. The University of Rochester's campus was originally in downtown Rochester at the United States Hotel, which was located on Buffalo Street near Elizabeth Street, which today is West Main Street near the I-490 overpass. In 1853, the campus moved east to a then-suburban location on what is now University Avenue. Local businessman and Congressman Azariah Boody donated 8 acres (3.2 ha) of land for the new campus, and the University purchased a further 17 acres (6.9 ha) from him. UR would remain on this campus until the current River Campus was constructed in 1930, and the university continues to own a small part of the University Avenue campus (where the university-owned Memorial Art Gallery is located). What are the academic rankings for University of Rochester? 1. number 39 for Academics. 2. number 93 for ROI (Return on Investment). 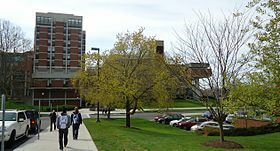 What universities are similar to University of Rochester?